"Goods" means the blinds, window furnishings or other products manufactured or supplied by Blinds4less Direct and the subject of the order made by You. "Blinds4lessDirect" or "We" or "Us" or "Our" means Blinds4lessDirect. Our site invites you to buy Goods from Us. A legally binding contract with you will only arise once Blinds4lessDirect has received payment for the Goods in full from you. We shall notify you of acceptance of Your order by e-mail to the e-mail address given by You in the order form. We regret We cannot accept orders placed by persons located or resident outside of the United Kingdom. 2.1 The price for any Goods ordered by You will be the price shown on the order confirmation page of the Blinds4less Direct web-site at the time You place Your order and will include all taxes applicable. WE ask you to carefully check your order confirmation to ensure that all details on the order are correct. 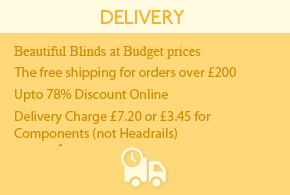 In the event of your not receiving an order confirmation please contact us immediately either by email at blinds4less@blueyonder.co.uk or by telephone 01952 457255 and we will email or fax or post an additional copy of your order to you. 2.2 Currently there is a delivery charge of £8 for orders delivered to mainland locations located within the United Kingdom. Any additional parts ordered may be subject to delivery charges, such charges will be notified to the customer prior to the order being processed. The delivery charge will be that shown on the order confirmation section of the Blinds4less Direct web-site at the time You place Your order. If there is any change in the delivery charge payable We will notify You before Your order is accepted by Us and ask You to confirm that You wish to proceed with Your order. 2.3 Subject to clause 6, We will debit the price, plus any delivery charge, from Your debit or credit card when We receive Your order or as soon as reasonably practicable thereafter. If more than one item is ordered We may deliver the Goods in installments but, if We do, We will not charge more than one delivery fee. 3.1 You cannot change or cancel your order or any part of your order once it has been processed and payment taken as these Goods will not be resalable by Us. We regret that once Your order has been accepted by Us in relation to such Goods and entered on Our manufacturing process We are unable to accept any changes to these Goods or cancellation of Your order. If you do wish to change or cancel your order Blinds4less Direct must be notified within 12 hours of receipt of email confirmation sent to you and even then if the manufacturing process has commenced no cancellation will be possible. If any blinds have been specified incorrectly, e.g. wrong colour or size, we will try and assist you with your order to the correct specifications but again if the manufacturing process has been commenced then no changes or alterations to your order will be possible. 6.3 Whilst every attempt will be made by Blinds4less Direct to ensure that the Goods sold and delivered match in every respect any sample or description shown or given or sent to You, any minor or immaterial variation or change in color or pattern between the sample or description and the Goods delivered shall not entitle You to reject the Goods nor to claim any compensation for such variation or change. 6.4 In the case of any fabric, metal finish, wood finish or any other finish related to any of our products, differences in colour will occur between different batches of material. Such differences shall not constitute grounds for a customer to refuse or return any of our products. In the case of wood blinds minor defects occur naturally within timber products and shall not constitute grounds for a customer to return or refuse any of our timber products. In the case of Wooden Venetian Blinds, warping of slats may occur and does not constitute a defect and is not covered within our warranty which refers only to the mechanical operation of the blind. Fading or bleaching of any of our products may occur when exposed to natural light over a period of time and does not constitute a defect and is not covered under our warranty. 7.1 Blinds4less Direct will deliver Your goods to the address You have provided on the order form for delivery as soon as possible after Your order is acknowledged by you and in any event within 30 days of the day after Your order was placed unless a later date is agreed with You (the thirty day delivery period to exclude public and Bank Holidays). We normally aim to deliver Goods within approx 7 working days of acceptance of Your Order. Blinds4less Direct can not be held responsible for late deliveries due to courier problems or if the customer or their agent is not present to sign for the delivery. We give no warranty that We will be able to deliver on any specific date. Delivery times are normally between 8am – 5pm Monday to Friday. Saturday deliveries may be arranged at additional cost. The cost of such Saturday delivery will depend on the nature of the goods being delivered and our sales staff will provide you with a quotation on request. 7.2 Notwithstanding clause 7.1, whilst we shall use our reasonable endeavours to meet the delivery date specified by You on the order form if We shall not be able to accept this delivery date We reserve the right to require You to select an alternative delivery date by notifying Us by e-mail at Blinds4less@blueyonder.co.uk with Your order number or call the order help-line on 01952 457255 with Your order number. 7.4 No goods may be returned to us without our knowledge or consent or without us issuing a returns authorisation number. Customers returning goods without our knowledge shall accept full responsibility for the loss or damage of such goods whilst in transit and also any charges incurred in returning such goods without authorisation. 8.1 Blinds4less Direct warrants that all Goods sold to You will be free from defects in material and workmanship for a period of 12 months from the date of delivery of the goods to You. 8.1.1 Should your goods arrive with a defect. that defect must be notified to us within 5 days of receipt of the goods or the warranty shall be invalidated. 8.2.2 for a courier to collect the defective Goods from You and simultaneously deliver replacement Goods of similar quality and specification, free of charge. 8.2.3. Refunds will not be made in respect of any made to measure blind which is found to be either faulty or defective, but on establishing that the product is defective a replacement product will be manufactured and delivered completely free of charge. No other product may be substituted for a defective product other than a remake of the original product. 8.5 Except where You are a consumer, Blinds4less Direct will not be liable for any indirect or consequential loss or damage or loss of profits arising out of Our supply or failure to supply the Goods to You. 8.6 The rights You have under clauses 8.1 and 8.2 above do not in any way seek to limit Blinds4less Direct . liability for death or personal injury resulting from Blinds4less Directs negligence and they do not limit any statutory rights You have as a consumer. By placing an order You authorize Blinds4less uk ltd at its discretion to carry out a credit reference or other enquiry upon Your financial status as Blinds4less Direct thinks fit and You agree to provide such written authorizations which may be required for the purposes of such enquiry. In the absence of such authorization We will be unable to process Your order. No statement, description, or recommendation contained in any catalogue, price list, advertisement, communication, the pages of this web-site or by any employee or agent of Blinds4less Direct shall be interpreted so as to enlarge, vary or override in any way any of these terms and conditions. Our Website together with all images, pictures, layouts and text has been designed by our own Web Development Team and all the contents thereof are subject to Copywrite Law. Any person, persons or company who downloads and uses any part or parts of our Website without authorisation will be subject to legal proceedings.